This statement caught my attention in particular because it aligns with one of the most important elements Quandora stands for: growth. And by growth, I mean of course growing a business and a revenue, but also growing as humans, growing our experience, our knowledge. First of all please note that his quote targets both leaders and employees. Growing is expected from everyone in the company. An organizational culture supportive of this idea is a great asset for both the individual and the company. The laws of nature taught us that if you don’t evolve, you die. That might not be the case when it comes to business, there are companies that survive by keeping a constant flow with no ups and downs, but you most definitely won’t make an impact. Some could argue that those “right skills” are critical and they would be, partially, right. Because it’s for those skills that you got there in the first place. It’s the second part of this phrase is the key – learning new skills. This is where Doug Seville’s (cofounder and director of DSML Executive Search) story comes in: “Seville once asked a bank credit manager how long it would take someone to learn his job, with 85% of capabilities. The answer? Two months”. I bet you just asked yourself the question mentioned above: how long it would take someone to learn do your job at 85% efficiency? 🙂 Scary, huh? Don’t let it grow too much on you – if everything could go down to learning a set of existing processes, everybody would be as expandable without any loss for the company, which is of course not true. Just don’t rest on your laurels and be willing to pick up new skills. It’s not about opposing the right skills to new skills. It’s important to start with a profile that fits with your position’s requirements, but that’s just a small part of it – what’s more important for the employees is the capacity to grow together with the company. Without an open culture towards discovering new talents inside the company, innovation would stand still. Knowledge has this great aspect of not being finite, so acquiring information never stops. And this is where employees’ and leaders’ ambition of growing prevails their initial competences. Your proficiency is never enough if you lack the motivations to grow. Not only for yourself, but by default, for the organization as a whole as well. There is, however, one very important issue I’d like to bring into question about this continuous growth best practice: don’t let it turn into an internal rivalry phenomenon. On the contrary, promote it as an opportunity to trigger internal collaboration actions – encourage people to share their expertise and know-how with each other, to gain more knowledge and stay visible. Soft skills emphasize hard skills. 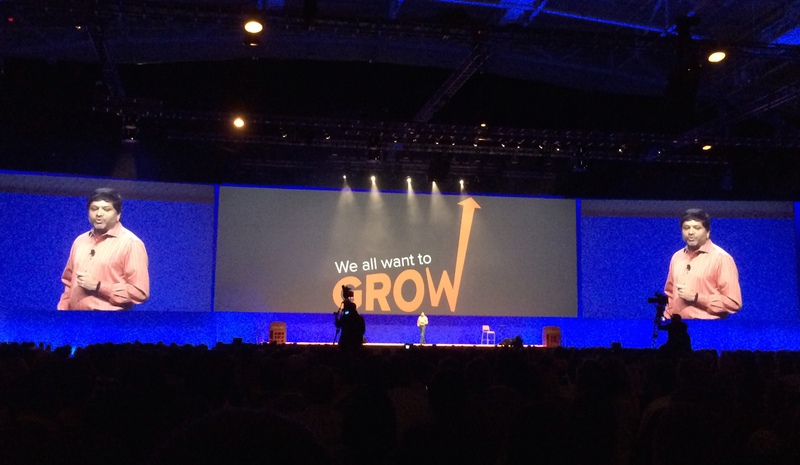 At the end of the day, just as Dharmesh Shah said in his keynote at Inbound 2014, wanting to grow is not something meant to divide us, but to bring us together: “What do we all have in common? We want to GROW”.